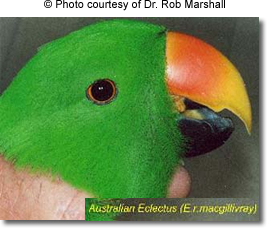 Common Diseases / Conditions of the Eclectus Parrot. 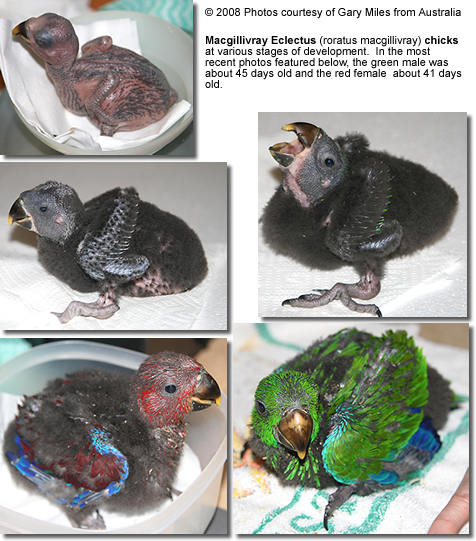 The distribution of the Queensland Eclectus Parrots aka Australian Red-sided Eclectus (Eclectus roratus macgillivraryi) is limited to the Cape York Peninsula of Australia. This species is not common and unknown in the United States or Europe. The mature Queensland Eclectus Parrots aka Australian Red-sided Eclectus are the largest subspecies of Eclectus Parrot, averaging 15.75 inches (37 to 40 cm) in length and weighting 450 to 610 g.
Their wingspan comprises about 280 millimeters and the tail is usually longer than 145 millimeters. They can be identified by their blue orbital rings. 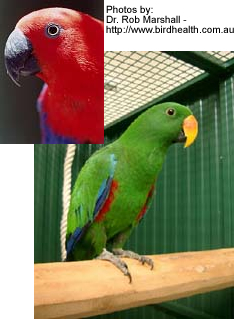 The male is very similar to the Red-sided Eclectus except that it is much larger and has a much longer tail (5.75 inches) with the light yellow edging on its tail being wider (0.4inches). The males have green feathering over most of their bodies. Their primary wing-coverts and primary flight feathers are blue, edged in green. The underside of the tail is black with a yellow tip. The iris is reddish-orange. The female of this species is very similar to that of the Red-sided female except that it is much larger and has a longer tail (5.75 inches). She is red with blue underwing coverts. Their primary coverts are blue, with a green edging. The tips of their red tails have pale edging. Their irises are a light, yellow-white color.